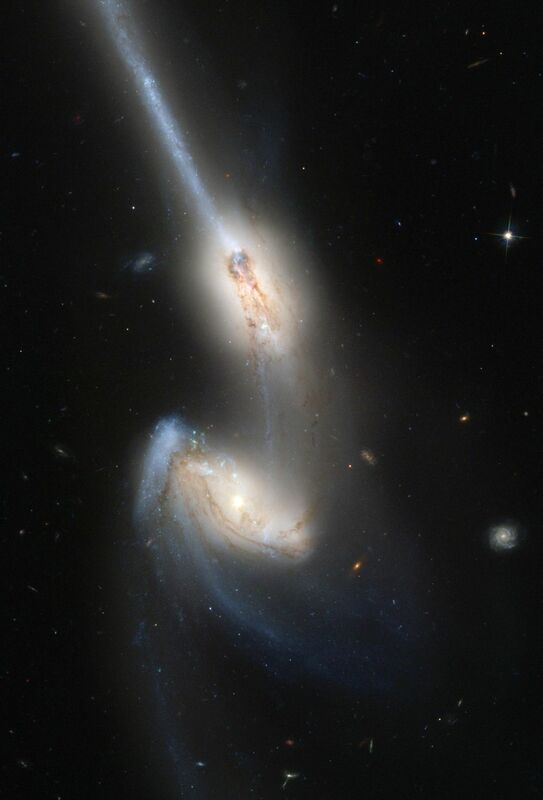 The Advanced Camera for Surveys (ACS), the newest camera on NASA's Hubble Space Telescope, has captured a spectacular pair of galaxies engaged in a celestial dance of cat and mouse or, in this case, mouse and mouse. Located 300 million light-years away in the constellation Coma Berenices, the colliding galaxies have been nicknamed "The Mice" because of the long tails of stars and gas emanating from each galaxy. Otherwise known as NGC 4676, the pair will eventually merge into a single giant galaxy. The image shows the most detail and the most stars that have ever been seen in these galaxies. In the galaxy at left, the bright blue patch is resolved into a vigorous cascade of clusters and associations of young, hot blue stars, whose formation has been triggered by the tidal forces of the gravitational interaction. Streams of material can also be seen flowing between the two galaxies. The clumps of young stars in the long, straight tidal tail [upper right] are separated by fainter regions of material. 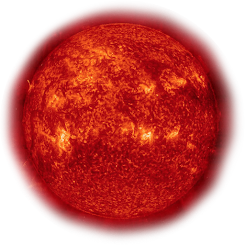 These dim regions suggest that the clumps of stars have formed from the gravitational collapse of the gas and dust that once occupied those areas. Some of the clumps have luminous masses comparable to dwarf galaxies that orbit in the halo of our own Milky Way Galaxy. Computer simulations by astronomers Josh Barnes (University of Hawaii) and John Hibbard (National Radio Astronomy Observatory, Charlottesville, Va.) show that we are seeing two nearly identical spiral galaxies approximately 160 million years after their closest encounter. The long, straight arm is actually curved, but appears straight because we see it edge-on. The simulations also show that the pair will eventually merge, forming a large, nearly spherical galaxy (known as an elliptical galaxy). The stars, gas, and luminous clumps of stars in the tidal tails will either fall back into the merged galaxies or orbit in the halo of the newly formed elliptical galaxy.